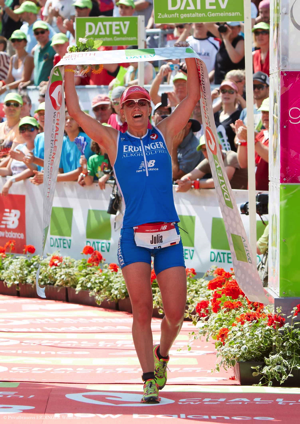 Here is the next Kona interview that will also be part of my upcoming Kona Rating Report (you can already pre-order): This one is with Julia Gajer, another German athlete that might surprise a lot of people with a good Kona result. 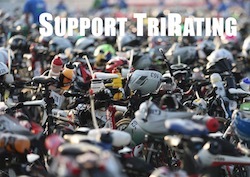 Thorsten: Can you give some background on how you got started in Triathlons? Julia: I got late into the sport and did my first triathlon in 2008 (Olympic distance). I grew up being a swimmer but didn’t have the talent to qualify for German or International Championships. During my time at university (I studied Pharmacy) I was really tired of swimming and therefore had about to years of not doing any sports before I started to run by myself just once or twice a week. In 2008 when I started my PhD, I bought a bike and raced my first three triathlons (two olympic, one half), which I all won. From that point on I was infected with the triathlon virus. In 2009/10 I raced Olympic distance races in the Baden-Württemberg Liga, some half distances (IM 70.3 Wiesbaden 2010, 5th place) and Powerman Zofingen 2009 (4th place), while working full time in a lab on my PhD thesis. In 2011 I became part of the Team Erdinger Alkoholfrei Junior team, which helped me quite a lot to develop as an athlete. We got the chance to train with the professional team and pick up a lot of stuff. In 2011 I did my first long distance race in Roth in which I finished 2nd. At the end of 2011 I was able to successfully complete my PhD, turned full-time Pro and became a member of the Team Erdinger Alkoholfrei Professional team. T: How was your season so far? J: I’m pretty happy with my season so far as my first goal for this year was to get a Kona slot. Eventhough I didn’t have a dream race (putting together a great bike and run) so far at the long distance events I raced, I really feel that I got stronger in all three disciplines this year. At the half distance race in Kraichgau, you could get a glimpse of what is possible when I perform well during the whole race. Therefore, I’m working quite hard right now to put it all together in Kona. T: You’ve probably heard a lot of stories about Kona and what makes it special. Have you been able to see the course yourself? J: I was able to fly over to watch the race and explore the course in 2012. From the first glimpse at the television, it doesn’t look too hard. But if you are on the course yourself it really is tough and honest. A real World Championship course. The heat and the wind make it even more challenging, especially on the run. That’s why I think that you really need to be ready to race Kona. When I flew over in 2012, my plan was to qualify for 2013, but when I watched the race and trained on the course, I felt that my mind and body were not yet ready for the race, that’s why I waited another year. There are some things that make Kona special: the conditions and the great depth of the field. For me it is really an honor and it gives me a lot of extra motivation to race the best athletes in one race. T: How do you prepare for Kona and how is that different from a “regular” IM? J: I prepare at home as I have really good training possibilities here and feel most comfortable sleeping in my own bed. I fly to Kona two weeks before the race to allow enough time to adapt to the time shift and climate. My coach and I created a special preparation for each of my long distance races. There are some basic sessions that you always do, but apart from that we’ve developed a specific preparation for each race. So I don’t really have a typical preparation that I can compare to my Kona prep. T: What are your expectations for Kona? J: If I can put it all together, a Top 10 result is possible, this would be a great result for my first Kona race. T: Julia, have a great first race in Kona!